'The Trouble With Girls' available for download! Today I was over at http://www.yes.com/#Scotty_Mccreery <-- Scotty's YES.COM site, this is a site that shows you when Scotty's song plays, what station it played on, and what the chart position the song is for that station. (I suggest y'all come over and YES Scotty's song) BUT!!! While i was there this showed up. ^^ right there it says this station is playing Scotty McCreery. Down on the Farm... UMMM WHATTTT So I went to the station site and on the station site, they also said they were playing it.. See below.. 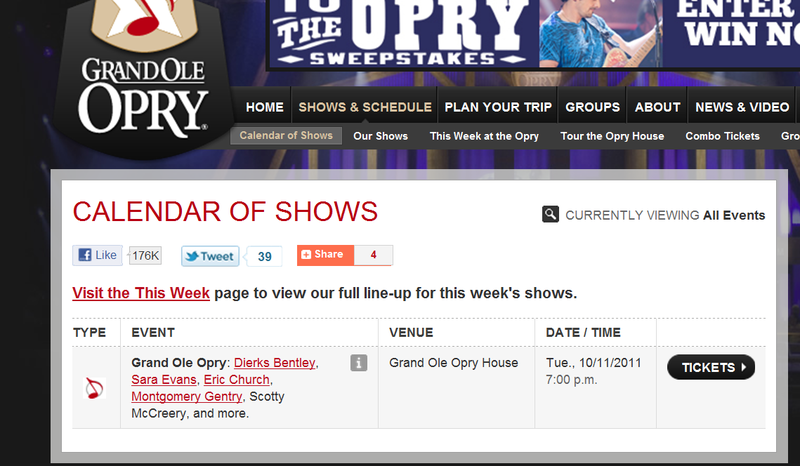 So I'm so confused, It say's they played a song by Scotty called "Down on the Farm" ?!?!?! Did anybody hear it?? http://www.yes.com/#Scotty_Mccreery <-- This is a site that any time Scotty's songs are played it shows up there. IT's not JUST a Scotty site, but any musician's songs show up there on their own page. Scotty has a page, and you can help push the song up the chart by yessing it when it gets played. When you yes the song it tells the station you like it. If you go over there, just make an account. :) It's very easy to use, and you can chat while there at the same time. Find out what Scotty & his family did during his down time in Maine. Scotty McCreery‘s latest single, ‘The Trouble With Girls,’ is already creating a buzz after hitting country radio today. The lyrics and music of the tune were penned by hit songwriters Philip White and Chris Tompkins, who on their own are responsible for many chart-topping hits. ‘The Trouble With Girls’ is the follow-up release to McCreery’s debut single, ‘I Love You This Big.’ Both songs will be found on his forthcoming album, ‘Clear as Day,’ set to hit stores in October. “They smile that smile / They bat those eyes / They steal you with hello / They kill you with goodbye / They hook you with one touch / And you can’t break free / Yeah the trouble with girls / Is nobody loves trouble as much as me,” the two wrote in the lyrics of the chorus. “The trouble with girls is they’re a mystery / Something about ‘em puzzles me / Spent my whole life trying to figure out / Just what them girls are all about / The trouble with girls is they’re so damn pretty / Everything about them does somethin’ to me / I guess that’s the way it’s supposed to be,” they wrote in the song’s opening lyrics. Season 10 'American Idol' winner Scotty McCreery drops a new single this week from his much-anticipated debut album, 'Clear as Day.' 'The Trouble With Girls' follows his Top 15 chart-climber, 'I Love You This Big,' and it just might be another hit ... at least Scotty's sister thinks so! "It's a really sweet song," Scotty says. "I played it for my sister and I said, 'Would you like to hear what's said in this song?' She said, 'I would love to have a guy say some of this stuff to me.'" Aw, shucks. Scotty says it's already one of his favorite tunes from the CD, due October 4th, which also features a song Keith Urban hand-picked for him. As the youngest and only male country winner of 'American Idol' dives fully into his new music career, he's also going to hit the books on the road so that he can graduate high school. But just because he's still young enough to be home-schooled by his mama, doesn't mean he can't charm the young ladies. The 17-year-old croons, "They smile that smile/ They bat those eyes/ They steal you with hello/ They kill you with goodbye/ They hook you with one touch/ And you can't break free/ Yeah, the trouble with girls/ Is nobody loves trouble as much as me." On Tuesday morning, Scotty McCreery announced he’d be returning home to Garner, N.C. to finish his senior year of high school. During an interview with WQDR in Raleigh, N.C., the ‘American Idol’ winner said he’s going to tend to the promotional obligations surrounding the release of his debut album on October 4, but he should be home in time to catch most of the second half of the Garner Trojan football season. The 17-year-old recognizes it won’t be entirely back-to-normal. After all, how many other seniors have a gold single or have spent their summer touring the country’s biggest arenas? It may be somewhat of a leap of faith to believe he’ll be able to melt back into the fabric of the community after all he’s gone through. “I think for the first couple of weeks maybe it might be a little weird, but then once all the kids and the faculty and everybody sees that I’m just the same old kid, and this show and this stuff hasn’t changed me, there’s going to be somewhat normalcy,” McCreery said. McCreery also asked if the radio station would allow him to participate in their annual concert benefiting the North Carolina Children’s Hospital. The November 30 concert in Durham, N.C. features Brantley Gilbert, Jason Michael Carroll, Jerrod Niemann and David Nail. Having another hometown hero on the bill (Carroll is from the Raleigh area as well) will surely sell out the venue, raising big bucks for children fighting life threatening illnesses. Tickets for the show are available at DpacNC.com. Scotty McCreery Explains "The Trouble With Girls"
Scotty McCreery releases a new song today called “The Trouble With Girls,” which is the second single from his much-anticipated debut album, Clear As Day, due Oct. 4. This song is the follow-up to “I Love You This Big,” a Top 15 hit that had the highest debut on the Billboard Hot Country Songs chart for a new artist’s first single since at least 1984. 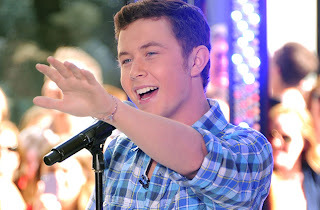 In May, Scotty won Season Ten of American Idol, becoming the youngest male winner and the only country male winner in the show’s history. Mr. Mike McCreery tweeted this afternoon that 'The Trouble With Girls' will be available for purchase tomorrow night on iTunes. 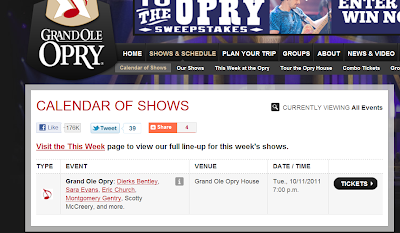 Scotty McCreery will once again, grace the Grand Ole Opry stage for his 2nd Opry appearance. He will be in good company as Dierks Bentley, Sara Evans, Eric Church, and Montgomery Gentry are also scheduled to perform that day!! This will come right off the heels of "Clear As Day",Scotty McCreery's first album, which is scheduled to release on October 4th, and 2 days after his 18th Birthday. Chances are this will be the first time he will perform many of his new songs live. Seems Mr. American Idol will have no down time for awhile. This is the first information I am getting about Scotty's appearances after the idol tour, and post album release. I'm sure there will be many more to come. This is a charity event! EVERY PENNY GOES TO CHARITY. Hope some of you can go out and see Scotty while supporting a great cause! 94.7 QDR invites you to a very special and affordable night for the kids. 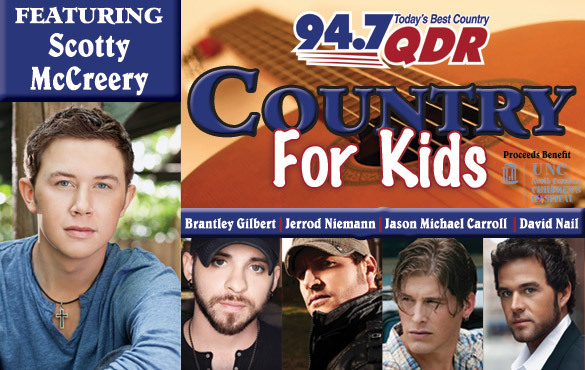 Join the Q Crew for a night filled with live music featuring American Idol winner Scott McCreery, Brantley Gilbert, David Nail, Jerrod Niemann and our own Jason Michael Carroll, Wednesday, November 30th. Tickets start at $50 for five amazing artists, and every penny benefits the NC Children’s Hospital. 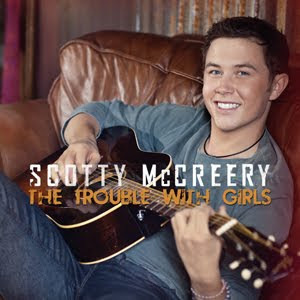 Scotty McCreery - "The Trouble With Girls"
The first thing to know about Scotty McCreery’s second official country music single – after the Top 20 debut of Coronation single “I Love You This Big – is that “The Trouble With Girls” is a song that proves that Scotty is a base tenor with more range than the guy who he is most often compared to: Josh Turner . The second thing you need to know is that aside from an epic swirl of strings around and after the bridge of the song, the production stays just behind Scotty’s up-front vocal and given that the bridge is meant to showcase the euphoria one feels in a relationship, the strings and epic nature of that bridge and final verse work just fine in the context of the song. The third thing you need to know is that “The Trouble With Girls” has strong lyrics that twist the age old “Can’t figure these girls out” theme into an interesting sort of song that feels like a bonafide single from the first moment you hear it. "itahmccreery: Check out this picture of @ScottyMcCreery talking to us on the phone this morning. Snapped by mama @JudyMacGarner http://t.co/DxjgJfq"
'Scotty McCreery' New Single Listen Now "The Trouble With Girls"
I've sat here for a long time thinking and waiting to post it, since it will be heard tomorrow AM and is out there I will go ahead and post it. I won't EVER EVER EVER post leaked music that isn't authorized by Scotty McCreery's team. Leaks usually come the day or two before songs are released, and those I feel are ok. So enjoy.. Tell me what you think of it? I personally LOVE IT! I think it's right up his LANE and has a perfect country fit!!! American Idol’ winner Scotty McCreery will debut his brand-new single, ‘The Trouble With Girls’ — the follow-up to ‘I Love You This Big’ — on Tuesday morning with the Q Morning Crew on WQDR in Raleigh, N.C. On Monday, morning radio DJ Mike Wheless tweeted, “I’m gonna play the new single from @ScottyMcCreery (The Trouble With Girls) Tuesday at 7:10!” The radio station will also air an interview with McCreery, who grew up in nearby Garner, N.C.
‘The Trouble With Girls’ was written by veteran Nashville songwriters Chris Tompkins and Philip White. The title seems to suggest a song that will speak to McCreery’s ferocious female fan base. A source close to McCreery says it’s another ballad that has a sneaky twist at the end. Find out for yourself by listening to it tomorrow morning (and reading Taste of Country’s song review after the song premieres). ‘I Love You This Big’ is currently a Top 20 hit on the country music charts. It’s the first single from McCreery’s ‘Clear as Day’ album, which will be available on October 4. Scotty McCreery's 2nd single? "The Trouble With Girls." Will be my 12 O'clock Test Track tomorrow! On @941kmps! My new single "The Trouble With Girls" is gonna be hitting radio tomorrow! Listen for it, request it, and lemme know what you think! Tonight- Scotty will share some big news! Earlier today Scotty tweeted, "I'm gonna tweet y'all some big news tonight!" MJsbigblog.com reported that “The Trouble With Girls”, is co-written by Chris Tompkins (Before He Cheats) and Philip White who cowrote “I’m Movin On” by Rascal Flatts, “I’m A Survivor” and “He Gets That From Me” by Reba. Not sure if Scotty has more news or if WQDR "spilled the beans". Either way, if you are able be sure to tune into WQDR tomorrow morning by following this link. Also, if waking up at 7 eastern time is a little hard, we'll be on the look out for a video or audio link. Here is the full article that this post was based off of. Q. It’s always such a whirlwind for “American Idol’’ winners. Do you even remember winning at this point? A. I remember back to it. It’s all still a blur. It was definitely an intense moment, that pause that [host] Ryan [Seacrest] makes before he announces it. Q. ABC followed you and runner-up and fellow country singer Lauren Alaina around as you all participated at the recent CMA Fest. Do you feel like it’s been beneficial to navigate the post- “Idol’’ mania with someone else who understands what you’re going through? A. It’s got its pros and its cons. We’re both country and we’re both doing this together, so it’s a cool little thing. But we both want to be looked at as individual artists, and we talked to our managers about not making us look like the next Conway [Twitty] and Loretta [Lynn]. But it is fun to get to do this together, so it’s all good. Q. It seems like it’s all coming very naturally to you. Does it feel that way? Are you surprised that people commented that you made it seem effortless on the show? A. Definitely. When I was growing up I was always the guy who played with his guitar and stood in one place and was scared to move anywhere else, so I think “American Idol’’ kind of broke me of that. As the weeks progressed, I got more comfortable moving around and acting a fool and entertaining the crowd, so it’s definitely something that I think I picked up the last few weeks of the show and doing more things like CMA Fest or live TV or the arena tour we’re doing right now. I’ve got a lot more to learn. I’m young. Q. I’ll confess that I’m glad someone finally persuaded you to hold the microphone straight. A. Oh, I know [laughs]. I don’t know what the heck that was. I think it’s just because I’m used to pitching, and that’s how I hold the ball in the glove with the limp wrist in the glove. I never held a mike before “American Idol.’’ I just had my mike stand with my guitar. So I think it naturally happened like that and then naturally changed back to normal to where I didn’t look like a fool. Q. Are you doing any covers on the album, or is it all originals? A. It’s going to be all originals. There’s technically going to be one cover. Keith Urban pitched a song my way, and it’s one he did way back when he was part of the band called the Ranch. He’s on tour right now so we don’t know, but he said he might play guitar on the track. Q. The Nashville music community can be a little resistant to artists they perceive as not having paid their dues or taking a reality show “shortcut.’’ Some radio programmers said they wouldn’t be interested in playing your songs. How has the reception been since you won? A. When I went to Nashville for CMA Fest, that was one of the things I was worried about, meeting those guys and knowing that I’m just 17 and I didn’t grow up playing honky tonks for 15 years and paying my dues. That’s something that I know I have to do now. I have to go out there and work hard and try to stick around. It’s not going to be handed to me. It’s definitely something I’ve got to work for, but they’ve been great to me. Q. You’re a fan of classic country, so will “Clear as Day’’ be more like that or will it have a contemporary pop country bent? A. It’s not going to be poppy. That’s one thing we stayed away from. I grew up with the old-school stuff, so I didn’t want to completely stray from that. We’ve got the rocker songs, the uptempo stuff. But when we slow it down, the songs get more intimate, and you can definitely hear some of the more classic elements. Ohh. Keith Urban guitar cameo? Not only is he a fantastic player, he is so mighty fine. Heh. Sorry. I don’t know what the heck that was. I think it’s just because I’m used to pitching, and that’s how I hold the ball in the glove with the limp wrist in the glove. I never held a mike before “American Idol.’’ I just had my mike stand with my guitar. So I think it naturally happened like that and then naturally changed back to normal to where I didn’t look like a fool. It’s not going to be poppy. That’s one thing we stayed away from. I grew up with the old-school stuff, so I didn’t want to completely stray from that. We’ve got the rocker songs, the uptempo stuff. But when we slow it down, the songs get more intimate, and you can definitely hear some of the more classic elements. Scotty and the Top 11 will brave the onset of Hurricane Irene to perform at the Dunkin Donuts center in Providence, RI tonight. 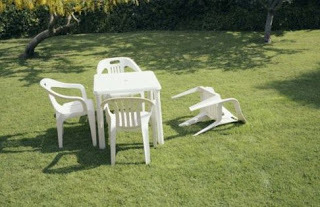 The concert originally scheduled for tomorrow in Albany has been postponed due to Irene until September 4. 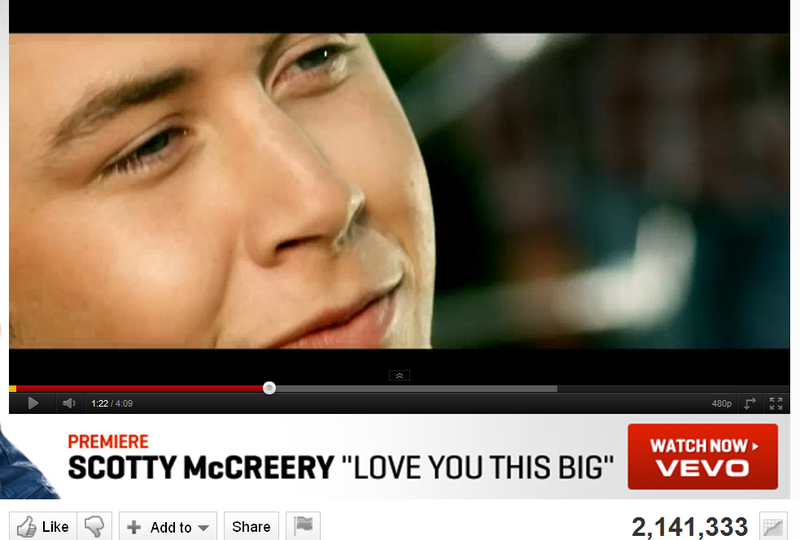 Scotty McCreery's video for Love You This Big has reached number one video position on CMT!! Moving up 18 spots in one week! We're all so proud of you Scotty!!!!! 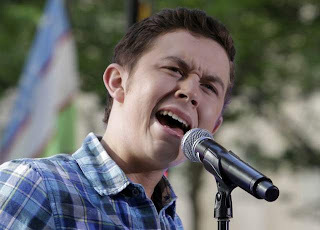 Five American Idol acts appear on this week's Billboard 200, led by Season 10 winner Scotty McCreery. Scotty's Walmart EP sold 12,000 copies last week, according to Nielsen SoundScan, putting him at No. 28 on the Billboard chart. wow. the #LYTB music video already has 2 million views on youtube. thank yall for watchin it and supporting me. Love yall. Here are the links to the 4 page Country Weekly Interview...enjoy CLICK THE FIRST SCAN TO MAKE IT LARGE ENOUGH TO READ. To read the article in a larger format click the links. Some of you might be able to click the picture right here on the blog, but others will have to go directly to the links. I'm not sure why that is. Who would you like to see at Countryfest 2012? | Country Fest – Best Music Festival in the Midwest,. Country Fest – Best Music Festival in the Midwest, Cadott, WI. Jam with 20 hot country music artists this summer. Get your VIP, Reserved, General Admission Tickets and Camping now. Carrie Underwood, Lady Antebellum, Miranda Lambert, Trace Adkins. Thank you Kayla for getting us this information. Can Scotty name all the winners of American Idol? Who would be a guest judge Scotty would like to see on AI? I think this might be with a bit of snark, but still all the news out there about the earthquake, and he picked Scotty to mention LOL. MEET 'Scotty McCreey' CMA Ultmate Awards Sweepstakes. 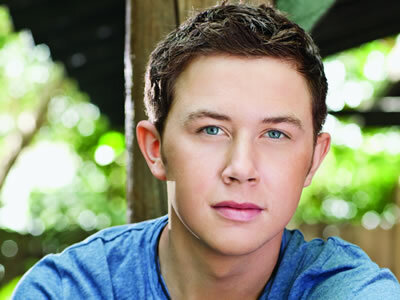 This is exciting news for Scotty McCreery fans if you can attend in November. The sweepstakes ends OCTOBER 18TH. Good Luck guys! Let me know if any of you win!!! It's quite the win with VIP passes, reception passes, behind the scene tour etc. The Ultimate CMA Awards Sweepstakes! This article made me laugh a little bit, being from NJ, I don't know anything other than paying to get on a beach. Additionaly, you pay more for holidays and weekends, and parking at the jersey shore will run you about 20 dollars for the day.. MORE if you spend the night at the boardwalk. I've always felt the same way Scotty does about it. You really shouldn't have to pay to hang out by the Ocean. I agree with you Scotty #CRIMINAL. ‘American Idol’ winner and North Carolina boy Scotty McCreery was the victim of a rude awakening while visitng the New York City tri-state area today. The ‘I Love You This Big’ singer visited Long Beach in Long Island, N.Y. and was completely and utterly shocked at having to pay to use one of nature’s facilities! He demonstrated his country boy way of thinking with his tweets about the matter, especially when he showed his local pride and stated his preference for the Outer Banks beaches in his home state. McCreery, who also rang the closing bell on the NASDAQ floor while in the area, has made his thoughts and feelings about pay-to-use beaches clear, and can’t say we blame him! Beaches, like hugs, should be free to all who want to enjoy them. When the Idols Live tour kicked off July 6, Season 10 champ Scotty McCreery and some of his fellow contestants found the perfect way to chill before performing for the crowd in Salt Lake City. It seems to be working. Idols Live ticket sales have averaged 97 percent this year, according to Billboard’s Boxscore chart. 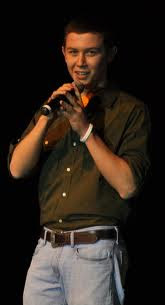 Audiences seem to be responding to this year’s Top 11, and headliner McCreery, in particular, whose mix of songs includes his debut, “I Love You This Big.” He also has performed “When You Say Nothing at All” with runner-up Lauren Alaina, a frequent duet partner on American Idol. 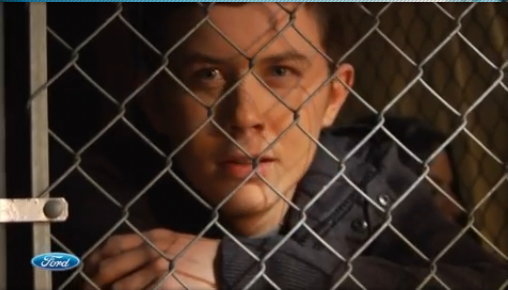 But, McCreery says, the two aren’t making music together offstage. “We’re just good friends,” he said. WILKES-BARRE TWP. - 2011's version of the American Idol Live Tour express roared into town Sunday night and as usual, the Mohegan Sun Arena at Casey Plaza was jammed and the amazing phenomena continued before a capacity crowd of 9,000 people. Now that the voting is over and the butterflies of the tour experience should be worked out, how did the Idols do when the real judges looked on - the paying audience? Well, at Mohegan Sun Arena on Sunday, some people who have attended all of the tours thought this one was the best by far! McCreery's boyish charm and classic country baritone make for an interesting combination and the steering of his artistic ship must be carefully chosen. He must have the right production and artistic direction to be taken seriously in the long haul. His single is lingering in the top 20 now and that's a good start. Not everyone will always agree but let's face it, the American public did well voting on this group. Very well. I have posted mainly what pertained to Scotty to read the complete review you can follow the link below. With a thunderous applause, Scotty McCreery brought the NASDAQ trading day to an end on Monday, August 22, ringing the closing bell at precisely 4PM ET. The ‘American Idol’ winner was flanked by a number of his tourmates, and a couple dozen young kids and teenagers. Everyone was very excited to see the stock exchange finish with a modest 3.54 point gain. McCreery has made numerous publicity stops during his reign as ‘American Idol’ champion. He looked somewhat out of place in khaki shorts and a T-shirt, although most of his tourmates were similarly dressed. Only Thia Megia wore an outfit more appropriate for a business setting. After being introduced, Jacob Lusk, Megia, Casey Abrams, Paul McDonald and Naima Adedapo took a moment to thank the dozens of viewers watching at home on CNBC or on the web. “I love life and I love music. Thanks everyone,” Abrams said to the delight of an off-screen audience. The group smiled for a few photos, and then the group of children came pouring in from all sides of the camera shot. The webcast didn’t explain who these kids were, but each one seemed to be excited to be around the ‘American Idol’ stars. More pictures were taken, and finally the countdown to the trading day’s end began. 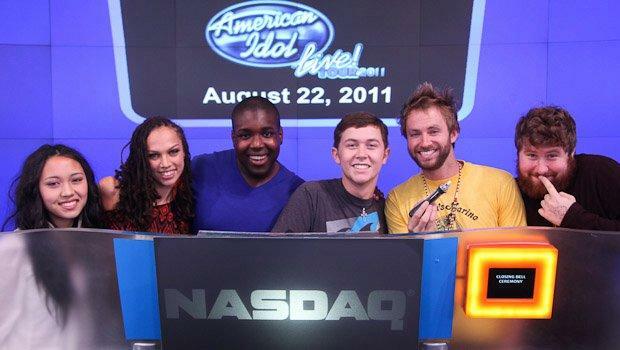 Ringing the NASDAQ closing bell is somewhat of a tradition for ‘American Idol’ contestants. Representatives from each of the last five season’s have done the honor. 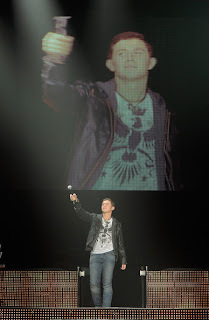 Scotty McCreery "American Idol Tour" 'Chicago' Video and Recap from a Fan. Gloria was kind enough to send these pictures and videos of her experience at the Idol Concert, along with a recap :) Thanks for sharing these with us! I first met his Dad Mike! and when they say father like son! its True! it was really funny walking up to scotty cause i was on a mission to have him talk to one of my really good friends on the phone and actually didn't just say hi im Scotty......he actually had a 2 minute conversation with her! (she and i Scotty fans from day 1) Scotty was sooo incredibly sweet! I would meet them both again and again....and again! BEST NIGHT OF 2011! The August 29th issue of Country Weekly magazine has a 4 page article spread of @ScottyMcCreery. Includes some great pictures and what he wrote to his high school classmates after winning AI. This week on Twitter, Scotty McCreery got his followers riled up when he teased them with details about his new 'Clear as Day' album … By not giving them any information at all. 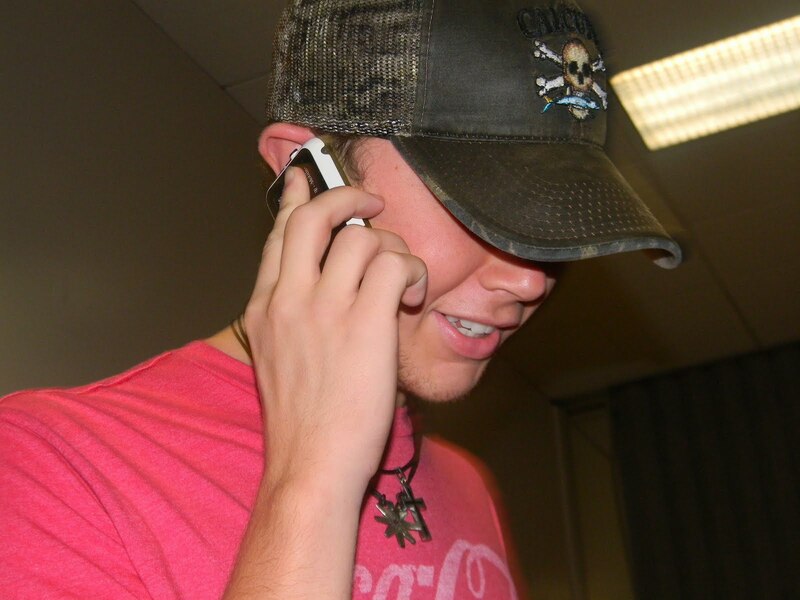 Scotty McCreery (@ScottyMcCreery): Had a good time chatting with yall tonight. lets do it again. Falling asleep to one of my favorite songs on the album called # ____________. We interviewed “American Idol” winner Scotty McCreery and runner-up Lauren Alaina when they were in Manhattan recently. You can go see them perform live at Nassau Coliseum Tuesday and Wednesday. Scotty, how did you feel when your name was announced as the winner of “American Idol”? Scotty: It was pretty wild. It was a moment I will never forget. There was a nerve-racking moment going up to that because Ryan actually made a 20-second pause. But it was pretty cool. When you made it to the top group and saw your competition, were you nervous or confident? Lauren: Nervous, because everyone’s so different and you never know how people are going to take to different types and styles. Scotty: And everybody was so good this year, too. Everybody can sing. Did you like living in the big house with everyone? Scotty: Yeah, it was fun while it lasted. Scotty, how does it feel now having a record deal? Scotty: It’s pretty cool. You know both me and Lauren have one. We’re looking forward to getting out there and recording and getting some new songs out there. Lauren: It’s cool. Was it hard saying goodbye to the other contestants when they were voted off? Scotty: It was at first, yeah. But then, when you got down lower, we realized we’d be seeing each other for rehearsals. Are you guys going to be singing a duet? Lauren: Yeah, of course. We always get paired together. Scotty: I think we’re going to try and work out what song we’re doing, but I think that’s the plan. This was a little lengthy, so I mainly posted Scotty's answers - you can click the link below to read the full article. Scotty McCreery brings country to ColiseumWhen the "Idols Live" tour kicked off July 6, season 10 champ Scotty McCreery and some of his fellow contestants found the perfect way to chill before performing for the crowd in Salt Lake City. "The very first night we pranked Jacob Lusk. We poured a bucket of ice on him in the shower," McCreery said by phone from Milwaukee, coincidentally the city of his "Idol" audition. "It just got us laughing so hard." Who knows what sort of ice breaker McCreery and the rest of the top 11 have in mind when the tour hits Nassau Coliseum Tuesday and Wednesday nights? (Perhaps a shoutout to semifinalist Robbie Rosen of Merrick, who'll be in Tuesday's audience.) For the country crooner from Garner, N.C., the whole "Idols Live" experience has been "pretty crazy," but in a good way. "Coming off of the show, I don't think any of us knew what to expect, but it's definitely a lot more fun, a lot more free," he said. "On the show, you're always worried about what the judges are going to say afterward. What the people are thinking back home watching the show. And now you're just up on stage having fun and you're just going out there to entertain, and that's what we want to do. It's cool for us." And it seems to be selling tickets, too. According to Billboard's Boxscore chart, "Idols Live" tickets sales have averaged 97 percent this year, with sellouts in at least eight venues, a sharp boost from last year's soft sales which resulted in seven tour dates being canceled. Audiences seem to be responding to this year's top 11, and headliner McCreery, in particular, who performs a mix of up-tempo and slow, sentimental songs, including his coronation anthem "I Love You This Big." ("I thought it was a really good song for the 'Idol' moment," he says.) And he's also gotten to perform "When You Say Nothing at All" with runner-up Lauren Alaina, a frequent duet partner on "Idol." But, McCreery says, the two aren't making beautiful music together offstage. "We're just good friends. People always speculated because they wanted to make something out of it in the teen magazines, but we've never been anything more than friends and I don't think we ever will be," he said. With his hectic schedule, McCreery wouldn't have much time for romance anyway. Besides the tour, he's been a fixture in the recording studio working on his debut album, which should drop in time for the holiday-shopping season, "Now we're getting the master mixes and getting it to where it's exactly to what we want it to sound like on the album," he says. "People can just expect a nice, fun album. There'll be some songs that will make you dance and get up and move around, and there'll be some songs where you'll just sit back and ponder life and think about things." And then there are those tunes that passed what McCreery calls "the Mama cryin' test." While choosing which songs to put on the album, McCreery's producers would email demo versions of many tunes, which McCreery would listen to with his family. "There were a couple of times that Mama would cry, and I'd respond, 'Well it passed the Mama cryin' test, so it must be a good one," he said. But fans shouldn't expect to hear McCreery's own songs on his disc. "Hopefully the next one I do, if I continue to stick around, I'll be able to get more of my own stuff on there," he said. It's all still a big leap for a 17-year-old kid from Garner, N.C., who last year was bagging groceries and was a star player for his school's baseball team when he decided to audition for "Idol." He was understandably nervous that his brand of old-school country might not fit in with "Idol's" emphasis on finding a pop star. "I always knew I was going to do country if I made it and then I'd sing Frank Sinatra afterward. When I got done with my first song, the lady looked at me and she said, 'This is not "Nashville Star." You've got to be able to sing something different.' I said, 'I know, I'm country, but I can sing different stuff.' I just wanted to stay true to me and hope that worked out for me." It did and he got his golden ticket to Hollywood, where he immediately became the one to beat on "Idol," especially after the early elimination of power belter Pia Toscano. McCreery is still at a loss to explain why he connected with viewers. "I just think Middle America could relate to me. I was just a high school baseball player, bagging groceries. I was just a normal kid who tried out for a show." His experience on "Idol" was anything but normal, from performing before millions of people each week to filming those Ford music videos. And then there was Gaga. 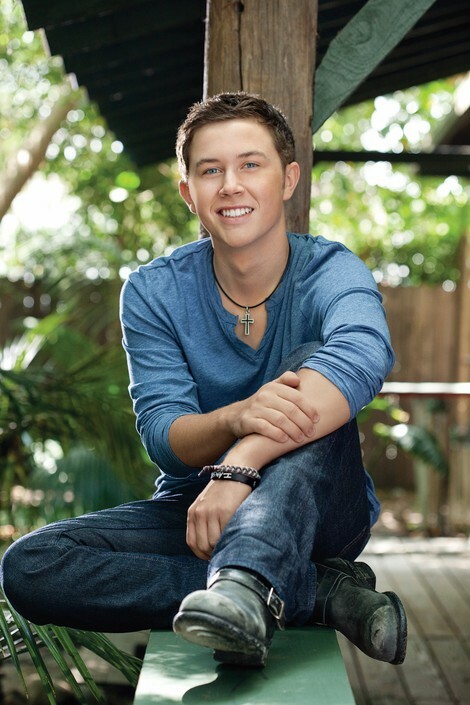 "Scotty McCreery. Lady Gaga. I couldn't think of a better fit," joked "Idol" mentor Jimmy Iovine the week that the flamboyant superstar took the finalists under her wing. McCreery seemed on the verge of blushing when Gaga suggested he make love to the microphone. "She was definitely interesting," says McCreery in a diplomatic tone worthy of Henry Kissinger. "She's very unique and that's what makes her her. I think me and her are very different as far as style and it made for some good TV." 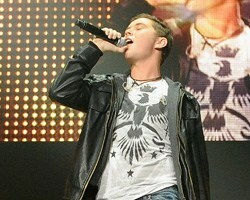 McCreery had a hard time following Gaga's advice, but listened up when the "Idol" judges spoke. "Pretty much everybody would tell me just stay true to yourself and you'll be all right," McCreery said. "Randy and Jennifer told me a couple of times to just stay in my lane. That was the phrase they used. I think I did that and I'm going to continue to do that and hope that it works out for me." I couldn't find a link online for these pictures so I thought I'd take a picture and at least get it posted on here. If anyone knows where the link could be found online or wants to scan the picture and send it in that would be great. In the comments section a few of you have said that you don't have a Twitter account but I wanted you to know some highlights Scotty mentioned during his Twitter party last night. He tweeted while listening to some songs on the album, so it sounds like they are all done and waiting to be released on October 4! There will be 12 new tracks on Clear As Day. He informed us that the funniest guy on tour is Paul and the funniest girl is either Pia or Haley. 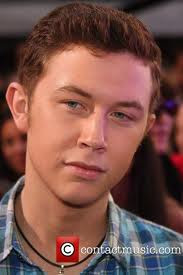 Scotty later said that the funniest prank involved ice and the shower in the dressing room. He mentioned in an interview that the boys all pranked Jacob by pouring ice in his shower. Scotty said that it's "all good" when someone mispronounces his name on the radio. He wrote that it's tough for him to say as it doesn't exactly roll of the tongue. As he was "hitting the hay" as he likes to call it, Scotty said that he was falling asleep to one of his favorite songs on the album. But he failed to mention the name, instead choosing to plug Clear As Day and say to find out you'll need to buy the album. The wait is getting harder and harder! You know you’ve made it when you’re getting your own documentary on GAC before your debut album is even out. That’s the case with latest American Idol winner Scotty McCreery who will be getting his own television special on GAC this Fall. “Introducing: Scotty McCreery” will feature footage of Scotty in his hometown of Garner, North Carolina, a backstage interview at the RBC Center, and behind the scenes footage of his home-town concert in July. Fans will visit his local church, high school and and highlights of his life growing up in the community. The special will air October 3rd on GAC. Todd Cassetty who produced Taylor Swift’s “Taylor Swift: Speak Now” special for NBC was also the producer for this special. The special airs one day before “Clear As Day,” his debut album, hits stores. Not an article surrounding Scotty, but an article that highlights what could have been caused somewhat by Scotty's influence. Titled TV Ratings Spur CMA Awards Bidding War, this article focuses on the fact that three of the top television networks are now all bidding on being home to the 45th annual CMA Awards. 1. ABC announced that almost seven million people watched 'CMA Music Festival: Country Music's Night to Rock'. 2. The article goes on to say that along with country singer Blake Shelton "becoming a house hold name" and Scotty and Lauren's "clean sweep" of American Idol, country music "has never been as visible as it has been in 2011". This all leads me to ask these questions- how many of you watched the CMA Music Festival for the first time this year for a glimpse of Scotty? And thinking back to the CMT Awards, we all knew Scotty would be there. Who watched looking for him? Also, how many of you will watch the CMA's if Scotty will make an appearance? Now, many of Scotty's fans would watch even without Scotty because of their love for country music but many of Scotty's fans have claimed they normally don't like country music. No word yet on if Scotty will present an award, perform or even be there but when it is announced, we will be sure to let you know! The 2011 CMA Awards will air live from Nashville's Bridgestone Arena on November 9 at 8:00 PM ET. Scotty along with Lauren presenting the duo Sugarland at the 2011 CMT Music Awards. Just thought it would be nice to take a walk down memory lane hope ya all enjoy it. "Pretty wild" are the words Garner, N.C., native Scotty McCreery uses to describe his whirlwind life since winning the coveted "American Idol" title in May. "It's been nonstop," he said in a recent telephone interview. "We've been here and there and everywhere. It's crazy. It's a lot of work, but it's a lot of fun." McCreery will showcase his deep baritone country voice when the "American Idols Live!" tour comes to the Richmond Coliseum Saturday. The event also features performances by this season's other top contenders: Casey Abrams, Haley Reinhart, Jacob Lusk, James Durbin, Lauren Alaina, Naima Adedapo, Paul McDonald, Pia Toscano, Stefano Langone and Thia Megia. 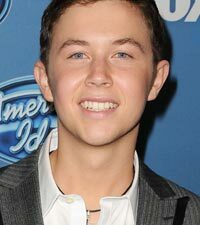 Before becoming the youngest male winner in "American Idol's" history, McCreery, 17, was a typical teen, hanging out with friends, going to school and making a little extra cash by bagging groceries in his hometown. Today, he is already a Nashville veteran. His single, "I Love You This Big," which he sang on the season finale, was the highest debut for a new artist's first single on Billboard's Nielsen Country Songs chart since 1990. His video for the song was recently released on his website, www.scottymccreery-official.com. In June, McCreery played and sang for 70,000 people at Nashville's CMA Music Fest, appeared on the CMT Music Awards and entertained audiences at the legendary Grand Ole Opry. "I was wondering if Nashville would accept the 'Idol' kid and they really welcomed me," he said. "Being that young and getting the opportunity to be on the Grand Ole Opry was a cool experience for me." McCreery's aw-shucks nature and jovial attitude made him a fan favorite with audiences during the competition. He said he can't pinpoint the moment he first began singing but his mom tells people he started testing out his vocal abilities when he was a toddler. "I was in the children's choir at church," he said. "When I was 6 or 7, I sometimes sang with the adult choir." The insightful teen understands that his life will never be the same after 'Idol,' and that realization comes with mixed feelings. "I miss doing the normal things I grew up doing but it's tough to go back to being the same normal person," he said. Southern to the core, McCreery clings to his roots even though he knows one day his career may lead to living in Nashville. "Home is always Carolina," he said, adding that he hopes to return to Garner to finish high school. 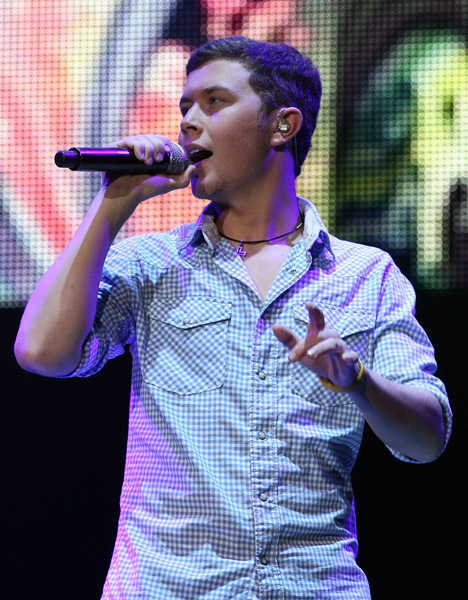 Even though he always looks relaxed when he's singing, McCreery admits he gets nervous before he steps on stage. "Once I get out there, I'm comfortable," he said. He's looking forward to the release of his debut album with Mercury Nashville/19 Recordings/Interscope. "I'm finishing up my part," he said. "We still have to mix and master it but we are pretty close. It will probably come out in early fall." "Idol" runner-up Lauren Alaina is also signed to the same label. Fans of the show will remember the dating rumors that surfaced after Alaina planted a kiss on McCreery when he was named Season 10's "American Idol." McCreery takes a diplomatic stance when asked if there are any sparks between the two by saying they are just friends who may one day collaborate on a song. "We've talked about doing a song together but we are still focused on establishing ourselves as separate artists," he said. "I am sure we will keep in touch." The "American Idols Live!" 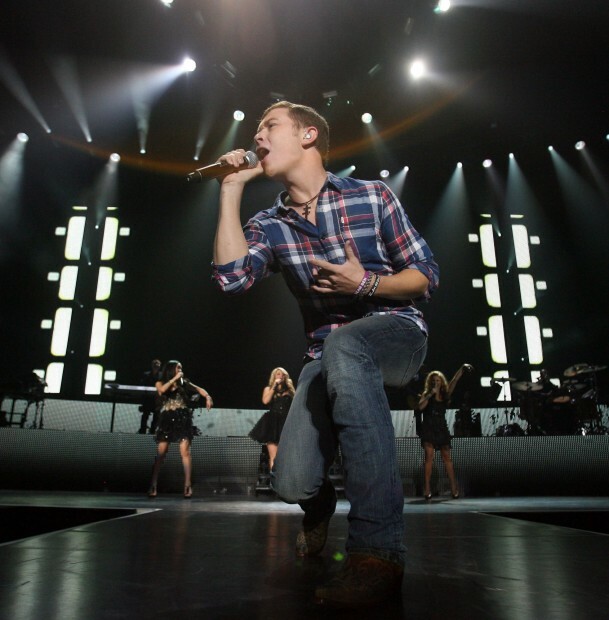 tour is keeping McCreery very busy on and off the stage. Any spare moments are spent with fellow contestants. "I am writing [songs] with the boys on the bus," he said. "When we get on the bus, we are jamming out with our guitars. We're laughing a lot, having a good old time." He uses his Twitter account to keep fans up-to-date on his whereabouts. 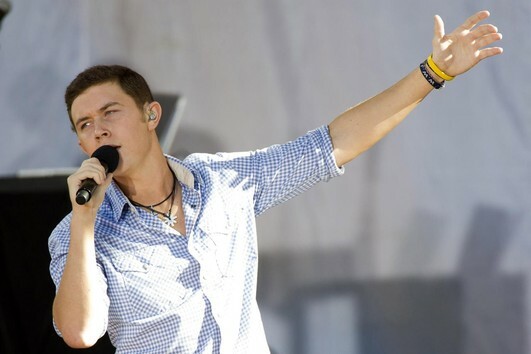 He recently secured the @ScottMcCreery handle and now has almost 300,000 followers. "I am definitely the tweeter," he said. The teen has already learned that his career is not really about him. "My job is about the fans," he said. He realizes that touring and being in the public eye are all part of the job description and said he's doing his best to remain levelheaded about his new-found fame. "I just don't see myself getting a big head or thinking I am big stuff. I remember bagging groceries," he said. "My mom and dad keep me in line. If my head gets big, they will slap it out of me real quick." After the tour ends, he will be thrust back into the media spotlight promoting his new album. "I'll have a couple of performances and then it's back to being a kid for a couple of months," he said. He believes "American Idol," which remains one of the most popular shows in America, was a great platform for him. "Not too many people can say '38 million people watched me perform,' " he said. Good news for anyone who is unable to attend the tour or wishes they had bought something while they were there. You can now purchase the exact items that are for sale on tour. The store is also having a sale right now- if you buy two shirts you get one free. Click HERE to be linked to the store website. Click HERE to see what shirts are on sale. We'll keep a watch on it all day and see HOW HIGH CAN IT GO?? What a day for Scotty, I Love You This Big goes Gold and Clear as Day reaches the top 10 on Amazon! If you tweet something today please add #CongratsScotty to your tweets. I see on twitter the fans are trying to trend it. I know from past trending experiences that when you want to trend something you must also add written text to your tweet, so it CANNOT just say #CongratsScotty, add something else to the tweet! I'm so proud of him today! What a day for you Scotty and to be a fan. We Love Ya This Big!